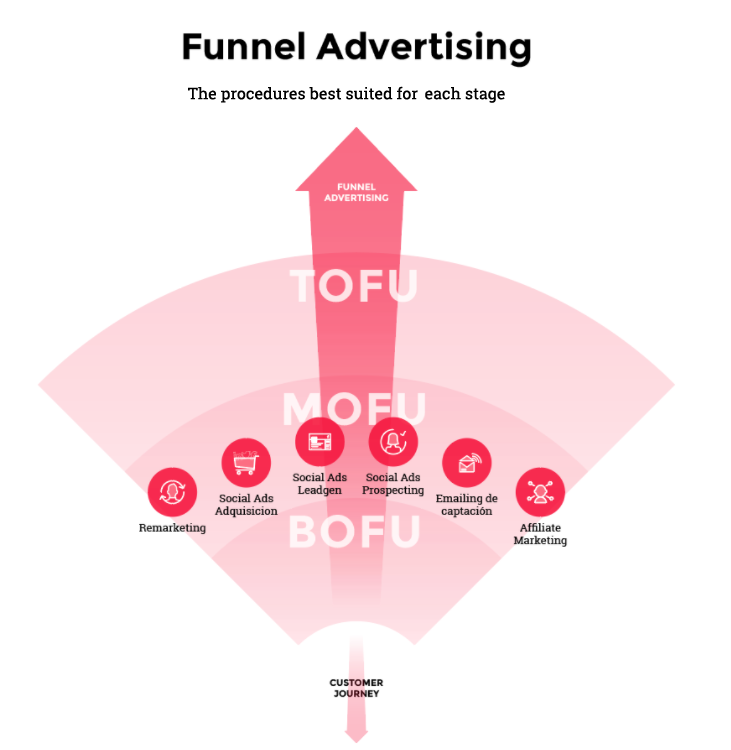 In the MOFU stage, within the Funnel Advertising Methodology, the consumer already knows what type of products or services could satisfy their need, thus finding themselves searching through the different options. Our objective is to be amongst the in the consumer’s options and, therefore, we must communicate to them all of the necessary information regarding us as a company, our product or our service. Remarketing or Retargeting of Client Acquisition (only visits, not sales). This consists of impacting users who/whom have already had previous interaction with the company. Social Remarketing – non purchase. In this stage we note that social remarketing is really for impacting those who are the earlier stages of the purchasing process. Social Ads Acquisition. This strategy is found in the middle of the Funnel depending/based on the space in which we would be working; acquisition campaigns based on competition, for example, are found in the MOFU stage of the Funnel. Social Ads Leadgen. These ads consist of getting registrations by way of social networks in order to broaden our database. Social Ads Prospecting. This tells the audiences that the system is capable of creating ? based on data that we could facilitate to them; for example, our buyers. Based on the type of data and percentage of similarity we will find in this strategy in one parte more or less elevated in the Funnel. Recruitment Emailing. This consists of impacting subscribers already in the database via a third-party, knowing that these individuals can have a high level of interest in whatever we are wanting to communicate/disseminate. For example, if we advertise a tourist destination, we would work with a database of people interested in the travel sector. Affiliate Marketing. This is an aspect of online marketing based on getting results. Companies, advertisers, or websites, all of which are called “affiliates”, are responsible for advertising to advertisers by way of the publication of their ads or promotions.